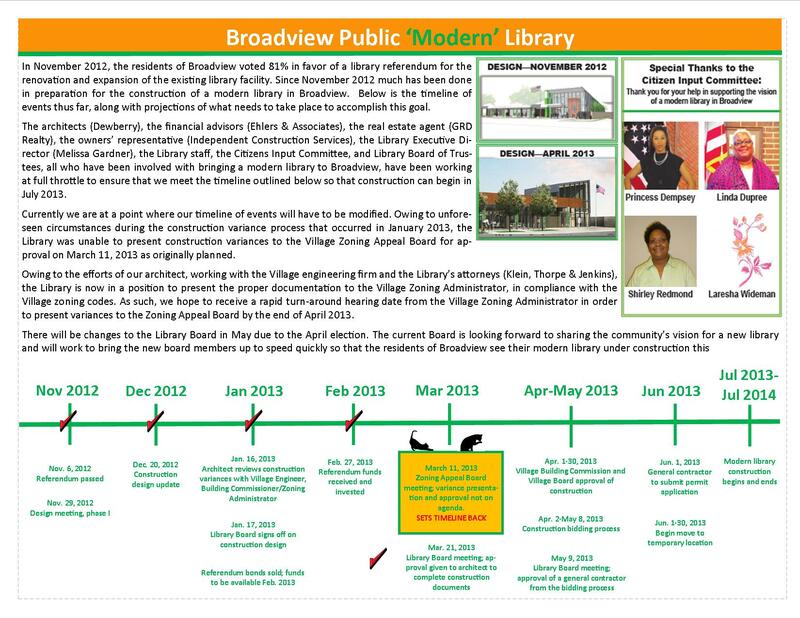 Questions have arisen as a result of an article about the Broadview Public Library District that appeared in the Spring/Summer 2014 issue of the Village of Broadview’s newsletter. We want to respond to that article by offering clarification of, and corrections to, a number of issues raised and allegations made in that article. The Library Board of the Broadview Public Library District, which is a separate governmental entity from the Village and not subject to control of the Mayor or the Village Board, started discussing its facility needs in March 2011 by surveying residents about the services of the library and building needs. The Board established a Facility Planning Committee, consisting of several members of the Board, to review facility issues. The Mayor and some Village staff members attended some of the Facility Planning Committee meetings. At several of those committee meetings variances were discussed with Village staff. After soliciting input from the public, the Board voted unanimously to hire Dewberry Architects to conduct a space needs assessment. After that assessment was completed, the Library held several community town hall meetings to present findings to the public and information about a potential building project. The Library also applied for a state grant for the renovation of the existing building. The Library Board also formed a Citizen Input Committee to gather additional input from residents, and it held several meetings during the summer of 2012. During these meetings and solicitation of input from citizens, the Board focused on the needs of the Library and the community as well as its financial resources. The cost of the project was a primary consideration for the Board, and the Board wanted to be fiscally responsible with its decisions. The cost to renovate the Library is much less than the cost to acquire land, demolish any existing structures and build a new building. In addition, available land within the limits of the Broadview Public Library District is limited. After learning that the Library did not receive the state grant, the Board reviewed its options and considered the advice of its financial consultant as well as the input from the public and decided to proceed with a renovated and expanded building rather than a new building. On July 19, 2012, the Board unanimously voted to move forward with a referendum question to issue $4.1 million in bonds to upgrade and make improvements to the current Library facility. Although the Library Director provided information to the Board, she did not make the decision to proceed because that decision is not within her authority as the Director. The Board made the decision to proceed with a renovation/expansion project and to seek bonds to pay for the renovation and expansion. The referendum passed with 81% of the voters supporting the issuance of bonds and the Library Board’s decision to renovate the existing facility to suit the public’s needs. The Library District Act requires a district going to referendum to prepare a plan and estimate of costs. Notice of availability of the plan and cost estimate must then be published in the newspaper followed by a mandatory 30 day public inspection period. The ballot proposition in the referendum is drafted to describe the plan. The Library followed the procedure outlined in the Library District Act. The bonds approved in the referendum are legally restricted in that they must follow the plan and cost estimate prepared by the Library. The bonds were issued in early 2013 and may only be used for the purpose set forth in the referendum, which was supported by the voters. The Library District Act requires a plan and cost estimate so that the public and the voters know in advance of referendum what the project will be, how much it will cost and what the bond proceeds will be used to pay for. The Library has worked diligently to provide all information requested by the Village in order to obtain necessary variances and to seek the issuance of a building permit for the Library Project. The architect met with Village staff in January 2013 and provided a full set of construction plans to the Village in March 2013. The architect and Library staff met with Village staff in July 2013 to respond to comments on the plans and to discuss the variation process. The Library submitted a completed zoning application seeking variances from the Zoning Board of Appeals (“ZBA”) on August 5, 2013. A ZBA meeting was initially scheduled for November 7, 2013 and was cancelled by the village attorney without consulting with the Library or its attorney. The ZBA meeting was rescheduled to December 5, 2013. At that meeting, the ZBA, after conducting a hearing and hearing testimony from the Library’s architect, the consultant who conducted a parking study and members of the public, voted unanimously to approve the Library’s requested variances. Despite the fact that the Village Code delegates final authority to approve or deny variances to the ZBA, the Village Board insisted that it has the authority to approve or reject the findings of fact prepared by the ZBA. The Village Board previously delegated this authority to the ZBA, in accordance with state law and within its authority as a non-home rule municipality. The Village Board, after a delay from December 2013 to April 7, 2014, voted to deny the findings of fact of the ZBA. The Library notified the Village of the finality of the ruling of the ZBA, but it refused to acknowledge the authority of the ZBA and failed to provide any justification or authority for the Village Board to take action with respect to the variances approved by the ZBA. As a result of the Village Board’s failure to comply with its own Code, the Library was forced to file a lawsuit against the Village in order to protect its rights and to seek court approval to move forward with the Library Project. The Library attempted to avoid litigation, but it was unable to do so due to the Village’s actions. Below is a sneak peak of the interior color palettes, furniture fabrics, floor and wall tiles, and carpet samples slated to grace the interior of the new facility.